WASHINGTON ““ Across the United States, Jewish community professionals are honing their skills of suasion, preparing to deal with a new crop of lawmakers who are unfamiliar with Jewish organizational priorities – and who are likely to be unenthusiastic once they’re in the know. This season of anti-incumbent sentiment, much of it swelling from the political right, presents the likelihood of a Republican takeover of at least one house of Congress. The GOP needs 39 seats to win in the House of Representatives; pollsters are predicting gains of 17 to 80 seats. The Tea Party insurgency has pushed past the GOP primaries a crop of candidates who have never held political office. Many of the freshmen are likely to arrive in Washington sharing their party’s warmth for Israel, but knowing little about the Jewish state or U.S. domestic issues that Jewish federations traditionally champion – elderly care, poverty relief, and other community services. The strategy, said Joyce Garver Keller, the executive director of Ohio Jewish Communities, a group that lobbies for the state’s federations, is to make friends now to prepare for more nuanced meetings after January. “The first purpose is to make a friend, not to come cold in January,” Keller said of her initial outreach to fresh Republican candidates, who have proliferated in her state. Ohio has a disproportionate amount of toss-up elections that could unseat Democrats. In the meetings she has with candidates, Keller outlines broad areas of concern, leading with support for Israel and the need to confront Iran over its suspected nuclear program, and then explaining Jewish community backing for safety net spending. She anticipates a long learning curve in a number of cases. “We have people running who have never been to Israel, and even if they have a position paper they don’t grasp that it’s more than a war zone,” Keller said. In some cases the learning curve may be insurmountable. Hours after Keller spoke with JTA on Friday, The Atlantic magazine revealed that Rich Iott, a Tea Party-backed candidate in the Toledo area, for years had spent weekends dressing up as an SS officer as a member of a group that re-enacted Nazi maneuvers. Iott, who has never held public office, seemed baffled that anyone was taking offense, even after the national Republican Party made him politico non grata. “Never, in any of my re-enacting of military history, have I meant any disrespect to anyone who served in our military or anyone who has been affected by the tragedy of war, especially the Jewish community,” he said in a statement. Iott was an extreme example but across the country, community outreach officials fretted at a political demographic that hasn’t had much overlap with Jews. Matt Goldberg, the Jewish Community Relations Council director in Louisville, Ky., said he was worried that spending reductions would result in cuts to security and social programs for seniors. National officials forecast a grim winter, noting threats by incumbent Tea Party-backed GOP senators Jim DeMint of South Carolina and Tom Coburn of Oklahoma to dry up spending. Despite overtures by top Jewish officials, DeMint will not budge, insiders said. If DeMint and Coburn are joined by another handful of hard-liners, they could muster the power to bring government to a halt, using the Senate’s arcane parliamentary rules that grant even lone senators sweeping powers to gum up legislation. “If you have Rand Paul in Kentucky, if you have Sharron Angle in Nevada, if you have Joe Miller in Alaska, you can have a tremendous impact on social services,” said one official, referring to three races where budget-slashing Tea Party-backed candidates are competitive. Of concern are possible cuts to Medicare and Medicaid, programs seen as vital to sustaining food and medical assistance to the poor and the elderly. One frustration for Jewish officials has been the demonization of “earmarks,” the district-specific spending widely derided as “pork” by conservatives. Earmarks fund an array of programs favored by Jewish groups, including naturally occurring retirement communities, the jewel in the federation system crown, and grants that enhance security at Jewish institutions. Matt Brooks, the Republican Jewish Coalition director, downplayed talk of a GOP takeover – but he also said Republican policies would not place at risk safety nets now funded by earmarks. “Perhaps there will be a different vehicle and a different level of accountability,” said Brooks, who last week oversaw a rollout of a $1 million ad campaign targeting Jewish voters in key states. The campaign includes attacks on what the RJC says are Obama’s economic policy failures. Robin Schatz, the director of government affairs at the Jewish Federation of Greater Philadelphia, said she had been making the case for earmarks to Pat Toomey, the conservative Republican running for the state’s open U.S. Senate seat. Toomey, who served previously in the House, at least is approachable and has strong relations with Pennsylvania Jews. In Kentucky, Goldberg has yet to communicate with Paul, who bested the establishment-backed Trey Grayson, who had close ties to the state’s Jews. 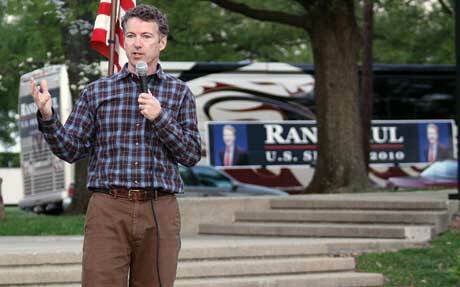 “Suddenly we’re confronted with Rand Paul, and he’s an unknown in the community,” Goldberg said. Grayson is from Louisville, where there are 10,000 Jews. Paul is from Bowling Green, which has only a handful of Jews. Goldberg said he had tried to get in touch with Paul but had yet to find a Jewish intermediary. Instead he’s only heard third-hand that the candidate is “more pro-Israel” than his father, Rep. Ron Paul (R-Texas), who has one of the House’s worst pro-Israel records. Goldberg said he was counting in part on pro-Israel evangelicals in the state to make Israel’s case. Keller said difficulties in establishing relationships are typical of rural districts. They key may be to go outside those cities: In Minnesota, in addition to hosting a JCRC gubernatorial debate, Jewish officials traveled to events like the Aug. 4 FarmFest debate in rural Redwood Falls in the state’s southwest, said Ethan Roberts, the director of the Twin Cities Jewish Community Government Affairs Program. When she scores a meeting, Keller said, she probes whether the candidate has a beloved relative – a grandparent, an uncle – in a nursing home. She then talks about the Jewish emphasis on caring for the elderly and uses, and explains, Yiddishisms like “bubbe” and “zayde,” which she finds candidates enjoy hearing. Months later, at an initial meeting in a congressional office, she will return to the issue, recalling the lawmaker’s beloved relative – and tie it in to her agenda. “It’s trying to personalize these billion-dollar issues that are numbers on a budget and talk to them about the safety net,” Keller said. Another area of concern is funding for Israel, despite broad GOP enthusiasm for the Jewish state. Keller said candidates often don’t realize until they get to Washington that Israel’s $3 billion in annual defense assistance is part of a $25 billion international assistance package – one the Obama administration hopes to double within the next two years. “You get a lot of people who get into office who say I like aid for Israel, but …,” she said. Backing the entire foreign assistance package has long been a sine qua non of pro-Israel support. Pro-Israel groups wince at conservative proposals to separate Israel funding because they say it smacks of a “special case” status they’d rather not have. Conservatives object to programs that fund family planning overseas, as well as aid for countries where governments do not vote with the United States in the United Nations and do not have democratic governments. Joel Pollak, a rare Jewish Tea Party-backed candidate hoping to oust Rep. Jan Schakowsy (D-Ill.) from her suburban Chicago seat, said the likelihood was that a Republican Congress would tweak foreign aid.